Suppose that a government pursues policies that raise the nation’s saving rate-the percentage of GDP devoted to saving rather than consumption. What happens? With the nation saving more. fewer resources are needed to make consumption goods, and more resources are available-to make capital goods As a result, the capital stock increases, leading to rising productivity and more rapid growth in GDP But how long does this higher rate of growth last? Assuming that the saving rate remains at its new higher level does the growth rate of GDP stay high indefinitely or only for a period of time The traditional view of the production process is that.capital stock of capital rises, the extra output when workers already have a large quantity of capital to use in producing goods and services them an additional unit of capital increases their productivity only slightly, This is in shows how the amount of capital per worker determines the amount of output.per worker holding constant all the other determinants of output. Figure 1 Illustrating the Production Function. 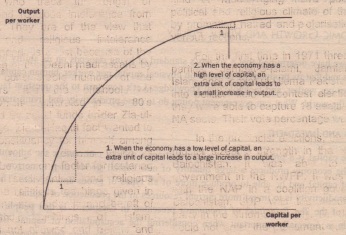 This figure shows how the amount of capital per worker influences the amount of output per worker. Other determinants of output. including human capital, natural resources” and technology, are held constant. The curve becomes’ flatter as the amount of capital increases because of diminishing returns to capital. Because of diminishing returns, an increase in the saving rate leads to higher growth only for a while ,As the higher saving rate allows more capital to be accumulated the benefits from additional capital become smaller over time, and so growth slows down In the long run. the higher saving rate leads to a higher level of productivity and income but not to higher growth in these variables. Reaching this long run however, can take quite a while. According to studies of international data on economic growth, increasing the saving rate can lead to substantially higher growth for a period of several decades. The diminishing returns to capital has another important implication: Other things equal, it is easier for a country to grow fast if it starts out relatively poor. This effect of initial conditions on subsequent growth is sometimes called the catch-up effect. In poor countries, workers lack even the most rudimentary tools and, as a result, have low productivity Small amounts of capital investment would substantially raise these workers’ productivity. By contrast, workers in rich countries have large amounts of capital with which to work, and this partly explains their high productivity. Yet with the amount of capital per worker already so high, additional capital investment has a relatively small effect on productivity. 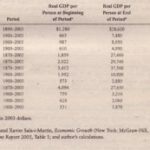 Studies of international data on economic growth confirm this catch-up effect: Controlling for other variables, such as the percentage of GDP devoted to investment, poor countries do tend to grow at a faster rate than rich countries. gave Korea a higher subsequent growth rate This catch-up effect shows up in other aspects of life. When a school gives’ an end-of-year award to the Most Improved student, that student is usually she who began the year with relatively poor performance Students Who began the year not studying find improvement easier than students who always worked hard Note that it is good to be “Most Improved,” given the starting point, but it is even better to be Best Student Similarly, economic growth over the last several decades has been much more rapid in South Korea than in the United States, but GDP per person is still higher in the United States.